I'm pretty sure I always say this, but Friendly's is such a middle of the road company that I never know quite how to describe them. They have an average texture that's somewhat soft and never really gummy (at least not on their normal flavors). It's not super creamy nor super dense, it's just an agreeable product that you can't argue with. So, in an attempt to bring a little normalcy into the house, I bought one such flavor. So how do you know it's a respectable C&C flavor? 1) Lots of cookie bits, so much so that the overall ice cream has a grayish hue to it and 2) Big hunks of cookies so that you know real cookies have been smushed in the name of C&C perfection. The better you execute these two points, the better the C&C comes out. As you can see, Friendly's has them both covered (though the gray is somewhat lost due to my flash). 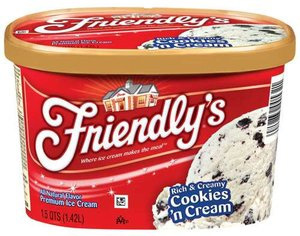 As always, Friendly's takes their respectable main stream base and makes good on both of the points I just mentioned. There's even cream filling in those giant cookie chunks. This is the way you want your C&C. Friendly's never really messes up with the base flavors. It's creamy and good flavor, not crazy strong, but not wimpy either. Will this flavor win awards? Probably not, but you never have to worry about getting jipped with Friendlys. Eureka! I've got it! 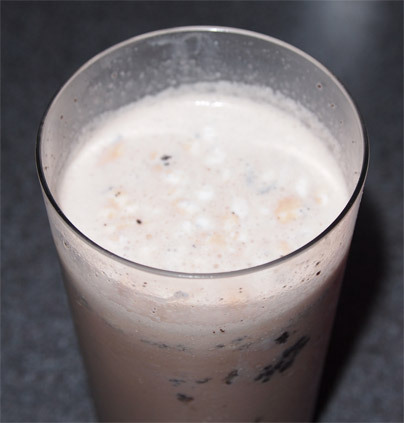 I'll throw a bit of ice cream in the bottom of my cup before throwing in the chocolate and milk, genius! .....or well I thought it would be. It kind of tasted funny. Sure you could blame the little bits of floating cream at the top, but there was a weird watery icy vibe to the whole thing. Maybe a different kind of ice cream would work better, but I'm in no hurry to find out. After my last few choices of "frozen desserts" I opted for Friendlys which I always considered growing up a mid tier brand. I must admit its prob some of the better ice cream...ICE CREAM :) I have eaten lately. This frozen dessert has really got me in a funk. Pretty soon its going to be like eating chilled crisco. I agree with your standards that you described for a good cookies and cream flavor, especially with the color aspect of it appearing grey. 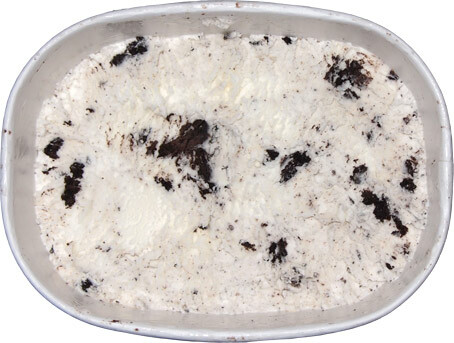 But from your snapshot, this ice cream seems too white and not grey enough to meet your criterion of a good cookies and cream flavor, so I'm surprised you gave this a good review. Your picture of the Breyer's Birthday Oreo cookies and cream is much greyer than this, so I thought that this was the exact color and appearance that you were describing in your standards for a good cookies and cream flavor. that would be why I said "(though the gray is somewhat lost due to my flash)". I often take a few shots before scooping my nightly bowl of ice cream but I may not review the photos for a few days, at which point the ice cream is gone and I'm stuck with imperfect pictures. Sorry! I didn't notice that you wrote that!